Sign up for free and just shop with The Body Shop as normal. Our average member earns over £300 cashback a year. If a basket has ginger shampoo and other products, the other products are eligible for cashback. All ginger shampoo within a basket we cannot pay cashback on. Ginger Shampoo is not eligible for cashback. The Body Shop cashback can be earned simply by clicking through to the merchant and shopping as normal. The Body Shop Cashback is available through TopCashback on genuine, tracked transactions completed immediately and wholly online. Browse an extensive range of luxurious body care products and save money thanks to our The Body Shop discount codes and cashback deals. They offer more than 900 skincare, cosmetics, fragrance and face & hair care products which are inspired by nature and ethically made, as well as gifts for treating someone special. Whether you are shopping for skin and beauty products or bath essentials like body butter, shower gel and scrubs, you can be assured they only use the finest ingredients from around the world and never take part in animal testing. If you are buying face products like cleansers and toners, shaving items for men or BB cream and foundation from their make-up range, all of their products are 100% vegetarian. Browse what's new in and keep your eyes open for great The Body Shop offers, which will save you money on everything from coconut oil hair shine, which will improve its health and moisture, to products from their Honey Bronze, Oils of Life, Shea, Tea Tree and Vitamin C ranges. They also offer a 25% discount to students. Join The Body Shop's Love Your Body Club and save money while looking and feeling great by earning points every time you make a purchase. You will receive 10 points for every £1 you spend, and they will give you a £5 discount when you reach 500 points, which you can either put towards your favourite products or donate to charity. As well as earning points, they will give you a £5 reward so you can treat yourself on your birthday, while you can also benefit from special offers, previews of new products, personalised skincare consultations and invitations to members-only events. You will also be joining a friendly community, where you can talk to other members and share beauty tips. Join for free when browsing the website or buying online, while you can also go into a store and ask a member of staff and start spoiling yourself when earning rewards, either by pampering your skin, updating your look or just treating yourself. It doesn’t matter if you’re a new customer or a returning one if you want to save, be sure to shop through TopCashback and get yourself a Body Shop Discount. Don’t forget that you can select and combine cashback with some of the amazing Body Shop offers to get the absolute most out of your money. You’ll find some of the best prices within their sale events, sometimes with up to 50% off. You won’t, however, see the sale all year round so, shoppers will need to plan ahead. 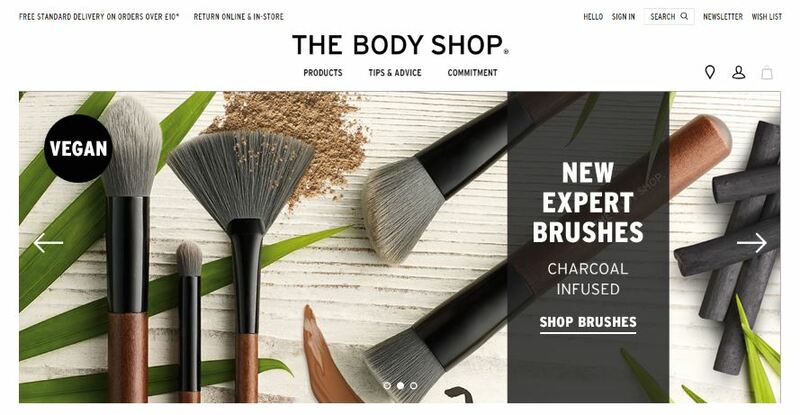 By getting signed up to the Body Shop email newsletter you’ll get a heads up to when the next discount event is going to hit, but not only that, you're going to get to know about smaller promotions and new releases too. Some offers you can expect to discover, include short flash sales, three for two on select lines, payday specials and even freebies when you spend over a certain amount. You may even find a free delivery offer, but if you’ve already added more than £20 worth of goodies to your basket, you get postage for nothing anyway. A final way to save is to become a member of The Body Shop’s Loyalty scheme, which you’ll find called the Love Your Body Club. Get signed up online or instore, and when you’ve got a membership you can earn points to collect and swap for rewards, gain access to member-only offers, plus you even receive a gift on your birthday. Once you have made your purchase using our The Body Shop voucher code deals, you can choose one of two delivery options. With standard delivery, your order will arrive within 3-5 working days from the date of ordering, while if you order by 2pm Monday-Friday, they will deliver your order the next working day. However, deliveries to remote locations, such as highland or island locations, may take two days longer. When you place an order, they will send you a confirmation email and another when your item has been dispatched. On the dispatch email, you will find a tracking reference link which you can use to track the progress of your delivery on the courier's website. If you have an account with The Body Shop, you can also select 'tracking reference' in your order history information. If you change your mind after receiving your order, you can return unopened items within 14 days and opened products which are unsuitable within 28 days for a full refund. If you bought an item online, it can be returned to any The Body Shop International PLC owned store in the country it was purchased, although you must ensure you take with you your delivery documentation and your confirmation email. Once the returned items have been received, it usually takes 3-5 working days for the refund to appear in your bank account, though if you paid by PayPal, it is usually refunded the same working day. Does Body Shop Test On Animals? The Body Shop were the first global beauty brand to fight against cosmetics being tested on animals and are cruelty free, 100% vegetarian and Leaping Bunny certified. They have never tested any of their ingredients or products on animals, while they only source ingredients from suppliers who meet the cruelty free and Leaping Bunny standard. Does Body Shop Use Microbeads? Polyethylene microbeads are no longer used in any of The Body Shop’s products. They made a commitment to replace these ingredients in 2014 and the materials they now use instead are either natural or naturally derived and biodegradable. Are Body Shop Products Natural? As a global retailer of naturally inspired, ethically produced beauty and cosmetics products, The Body Shop aim to obtain their ingredients, such as plants, herbs, fruits and nuts, from natural sources. They try to use naturally based ingredients where possible, which are selected for their natural skin caring properties, as constituents in their products. Are Body Shop Products Organic? The Body Shop produced its first ECOCERT certified organic skincare line, Nutriganics, in 2010. The range today includes foaming face wash and smoothing day cream, eye cream and night cream. Following this, they reformulated their hair range to ensure it did not contain any colourants and also produced a new line of deodorants which contained no aluminium salts - using volcanic minerals as a substitute. Shop for bodycare products which will make you look and feel great at The Body Shop and save money with these great cashback deals and voucher codes. Inspired by nature and ethically made, The Body Shop offers more than 900 skin care, make-up and body butter products, as well as aromatherapy, hair care and bath and body products and gift sets. Take up one of our deals or grab a voucher and make savings when you buy. They source some of the finest ingredients from the four corners of the globe, never test on animals and all products are 100% vegetarian.